A part of the wonderful set of icons called the Great Deisis from Holy Dionysiou Monastery on Mount Athos, which includes Our Lord Jesus Christ (J52), the Theotokos (T59), St. John the Baptist (S297) and St. Paul (S298), these masterpieces were painted in a.d. 1542 by Euphrosynos the Cretan. 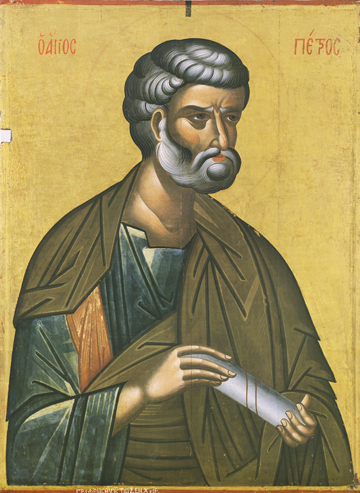 Here St. Peter, the leader of the Apostles, is shown reaching out in supplication to his Lord Jesus Christ in intercession for us, carrying a scroll representing his Universal Epistles. This simple fisherman became, through his ardent love of his Master Jesus Christ, a profound teacher, whose eloquence brought over 5,000 to the Faith at his sermon on the Day of Pentecost. After the Resurrection, St. Peter was fearless before authorities, and many miracles flowed out from his hands.